Today marks a full circle for the F54 MINI Clubman – we were there at the world unveiling of the new wagon in Berlin in June, then tested it across the tight winding roads in Sweden. Now, the second-generation model has finally been launched in Malaysia, in both Cooper and Cooper S forms. We’ll start with pricing – the base MINI Cooper Clubman is priced at RM203,888, while the MINI Cooper S Clubman retails at RM253,888. Both prices are on-the-road without insurance, inclusive of a four-year, unlimited-mileage warranty and a four-year/60,000 km free service package based on the MINI’s onboard Condition Based Service. Billed as MINI’s biggest ever model, the new Clubman is rather different from the one that preceded it. Out goes the useless “Club” suicide rear door, replaced by four full-sized, forward-opening side doors; with the characteristic barn doors retained, this technically makes the car a six-door wagon. Measuring 4,253 mm long, 1,800 mm wide and 1,441 mm tall – with a wheelbase of 2,670 mm – the new Clubman is not only longer and taller than the regular hatch as the outgoing model was, but wider as well. It also features a completely different body, so this isn’t a just a stretched 5 Door. From the front, the Clubman is differentiated by a unique grille and bumper design, as well as MINI’s first implementation of BMW’s Air Curtain intakes and Air Breather vents, reducing turbulence over the wheels. The side indicator panels are also different on the F54. Moving towards the rear, the tail lights are now horizontal (à la Paceman) instead of vertical on other MINI models, and are inset into the rear barn doors. This is pretty much as was shown on the Clubman Concept that preceded it, except with a single tail pipe on the left and a simpler rear bumper design. The sportier Cooper S is differentiated on the outside through a faux bonnet scoop, more aggressive front and rear bumpers, a mesh front grille (with a single chrome rib rather than the Cooper’s multiple slats), unique side indicators, twin exhaust exits on either side of the rear bumper and plenty of S badging. Both cars come with automatic full LED headlights and LED fog lights as standard, along with puddle lights – the latter projects the winged MINI logo onto the ground below. In terms of wheels, the Cooper receives silver 17-inch Net Spoke wheels, while the Cooper S gains gloss black 18-inch Star Spoke alloy wheels; run-flat tyres are standard fit across the range. Inside, there’s a new dashboard design that features a lozenge-like upper panel encircled by an outer frame, while the toggle switches and climate controls are housed in a thick wraparound surround. There’s also a space-saving electronic parking brake and a taller centre console. The Cooper comes with Firework Carbon Black fabric upholstery with Hazy Grey trim and a sport leather steering wheel. 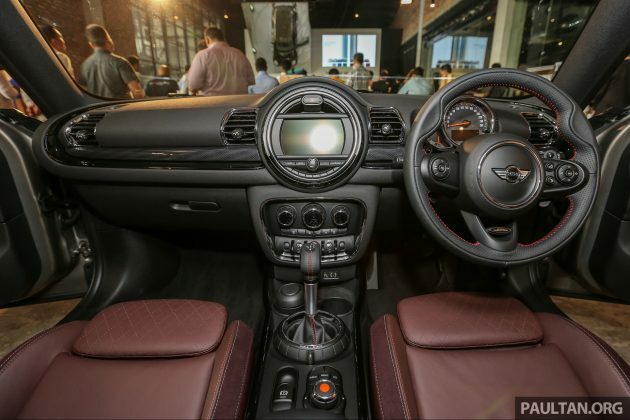 These are replaced on the Cooper S by the funky Cross Punch leather seats in Pure Burgundy, along with Piano Black trim and a John Cooper Works steering wheel with red stitching and paddle shifters. Both get Chrome Line interior trim and an anthracite headliner. Elsewhere, the increased dimensions mean there’s now room for five full seats, as well as a 360-litre boot – the latter figure is 82 litres up on the 5 Door. Fold down the 40:20:40 split-folding rear seats and you’ll boost cargo space to 1,250 litres. Standard kit includes cruise control, dual-zone auto air-con with rear vents, rear parking sensors, auto wipers, an auto-dimming rear-view mirror and a MINI Visual Boost radio with a 6.5-inch centre display. The Cooper S adds powered front seat adjustment with driver’s side memory (a MINI first) as well as Comfort Access keyless entry with Easy Opener which allows you to open each barn door via a kick under the rear bumper. 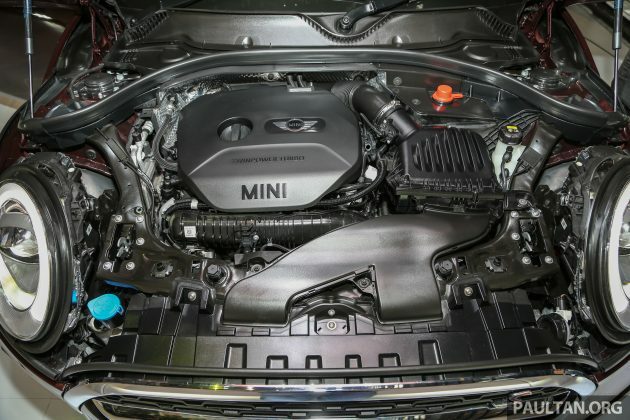 Under the bonnet, you’ll find the same MINI TwinPower Turbo engines as on the hatch models – the Cooper is powered by a 1.5 litre three-cylinder engine, producing 136 hp at 4,400 rpm and 220 Nm (230 Nm on overboost) at 1,250 rpm. Mated to a six-speed Steptronic automatic transmission, it goes from 0-100 km/h in 9.1 seconds before reaching a top speed of 205 km/h. Fuel consumption is rated at 5.4 litres per 100 km. Punt for a Cooper S and you’ll get a 2.0 litre four-cylinder engine instead, boosting output to 192 hp at 5,000 rpm and 280 Nm (300 Nm on overboost) at 1,250 rpm. Unlike the Cooper, this one comes with an eight-speed sport automatic transmission – the same unit as on the BMW 2 Series Active Tourer and Gran Tourer, as well as the X1 – for the first time on a MINI. As such, the 0-100 km/h sprint time is now cut down to 7.1 seconds, while top speed is extended to 228 km/h. Despite this, it uses just a bit more fuel than the Cooper, at 5.9 litres per 100 km. 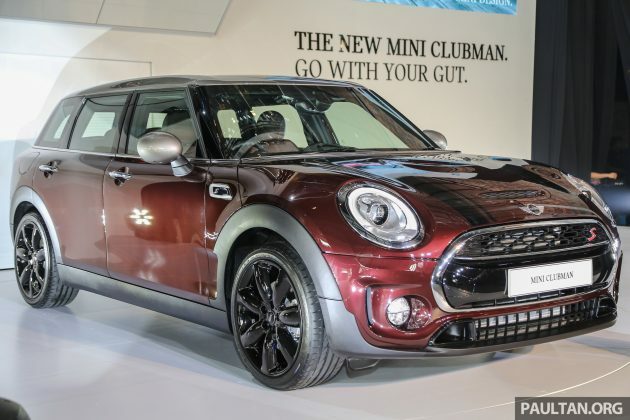 The Clubman comes in a total of eight colours, including the new Melting Silver and Pure Burgundy. As for the rest of the palette, they include Pepper White, Midnight Black, Moonwalk Grey, Deep Blue and British Racing Green; Thunder Grey is only available on the Cooper S. Want to know how the new F54 MINI Clubman drives? Read our full review here. You can also browse full specs and equipment on CarBase.my. Second hand much much cheaper! Yang merah tu dah macam keli goreng sambal. What’s the purpose of this car? 508 GT SW or i40 Tourer are better. what a good car, awesome pricing. A bit low price because we dont get HUD and panoramic sunroof? 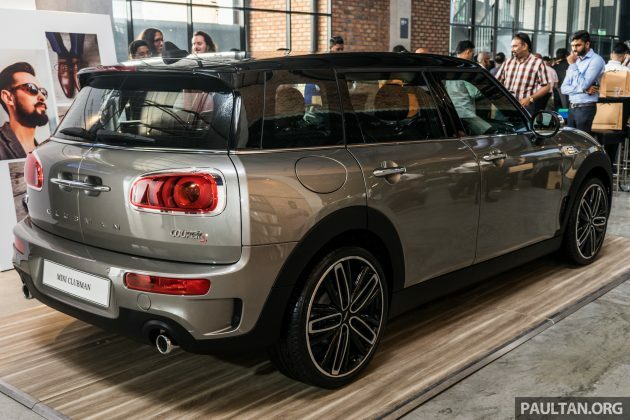 This is technically the biggest model Mini has and for the price of the S, one would expect it to have the 8.8 inch navi unit like the Cooper S hatch has as well as a reverse cam. No complaints on the base model as its priced accordingly. For BMW, reverse cam is still a luxury. Even the RM300k 330i doesn’t have it. actually looks good , if u r looking for sting totally different this is it , doesnt compromise space either..
i like the weirdness of the whole thing TBH! How a comment would reflects someone as a average guy or someone who got a unique taste. If RM50k, I want one.